If you remember, this is the year of the "anti-resolutions". This is the year to cleanse myself, or at least try to, of habits which are self-destructive. I still spend too much time in the cult of celebrity, but I'm getting better. I'm also posting less in social media and trying not to beat myself up as much. While the former is simply a matter of, as the cursor hovers over the latest gossip, opting not to click, the latter very much is telling myself that I'm okay as I am, that I will be okay as I am and that, if I need assistance or information, there are people out there who can provide that. But I did decide to make one resolution. 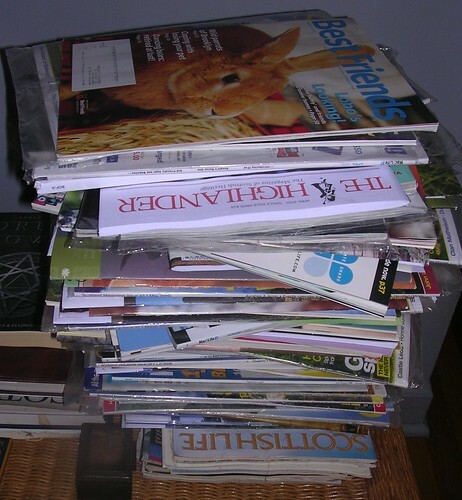 At the beginning of the year, this was the stack of magazines on the ottoman. That's eight, count 'em, eight magazines left. This is a far cry from a couple years ago when the pile could have injured one of the girls. 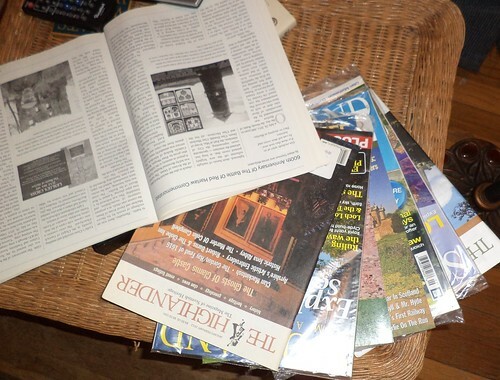 When I realized that I was getting caught up on magazines, I decided I would resolve to finish off the pile, completely, before I did any crafting. I honestly don't know what my craft for this year will be and that's primarily due to my decision to read these instead of craft books. Since the top photo was taken, I've read 3 more magazines. There are 5 left. I get one Scottish magazine and Cooking Light and a cross-stitch magazine and that's it. That's enough for me to be able to stay on top of them and not let them get into the paper equivalent of a mountain. What will I do when the stack is gone? Well, my goal is to read 12 books, one for each month. I realized in December that while I don't add to my personal library, I also don't remove things from it. It's tough to get rid of books but I've come to understand that I don't tend to re-read them, even if I liked them the first time. I'm debating about my collection of Terry Pratchett's Discworld. I haven't picked up any of them, except for the first two, since I read them the first time. As I seek to divest myself of stuff, I need to look critically at what books I keep and what books I take to a used book store. For now, I'm working on the magazines. The Highlander tends to be more article than photos. Scottish Life has an equal part article and photos but it has several columns that do not have a lot of photos so they take time to read, although I will simply skim the column on whiskey since I no longer drink. The Scotland Magazine is more photo than words, something I don't like. Plus, their proofreading, even if I allow for the differences between US and British grammar, leaves much to be desired and is very bad. Let's just say, I have not missed that magazine coming into my home. It's a good feeling to be this close to having the stack gone.